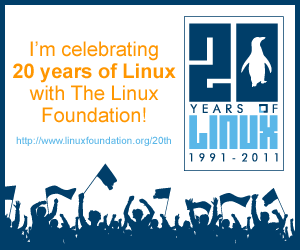 The Linux Foundation has released a video commemorating 20 Years of the Linux Operating System. The video, aptly named 'The Story of Linux' quickly depicts the growth of Linux over the years(though any reference to the GNU project is entirely omitted for some reason). One other collection of videos we strongly recommend for everyone to see are these awesome Blender made animations and short films which you probably haven't seen before. Interested in more such stuff? You need to further browse through our videos category. Also, you might want to check this collection of 11 of the biggest Open Source success stories that are changing the world as we know it.